The Tethys Chronicles is the name of my steampunk series starring private investigator Jacquie Renairre and her partner Clay Baneport. The series is set in the fiction world of Tethys (hence the name). To help flesh out the world for you readers, I’ve decided to upload some sketches and concept art I made while writing The Exile’s Violin and the forthcoming sequel, Terraviathan. War machines. Circled are some rough sketches for what a steam-tank might look like as well as Alesir’s Iron Striders. 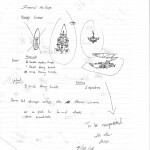 Sketches of some airship designs. I don’t believe any of these made it into my “vision” of the novel. 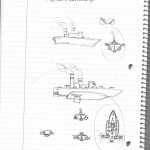 A sketch of a Kenestan battleship. 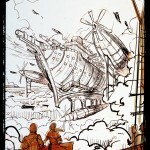 I wanted to marry the look of a naval vessel with some steampunk-y blimp-y elements. 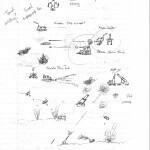 More airship designs and some sketches of battles. 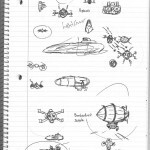 I really like the “Bombardment Zeppelin” one. That design did make it into the final version of The Exile’s Violin. 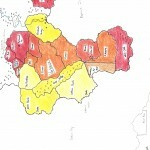 A map color coded to the relative wealth of certain neighborhoods in Vorleaux. Dark red equals the highest end of the spectrum. A map of Vorleaux, the city where a lot of The Exile’s Violin takes place. 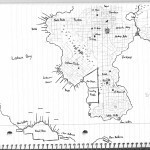 Across the bay is the city of Taleaux, but I never drew it, and it didn’t end up playing a big part in the finished novel. 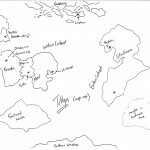 A very rough sketch of the world of Tethys. A finished version is included in The Exile’s Violin. A political map of Tethys. I colored it in with my rudimentary Photoshop skills. Too bad the colors make it hard to read some of the names. A WIP sketch of the cover art for The Exile’s Violin. The final version has Jacquie’s head turned so the viewer can see her face. A version of the WIP cover art where I added a filter for the fun of it. Even though the airship isn’t one of my designs, I’m really happy with what Enggar came up with.